I definitely recommend stopping by the blog, it’s a great fusion of techno-generational savvy and news you can use. I watched the new movie, The Bucket List, last night. I won’t give you any spoilers but I’m sure you know how a flick about 2 guys dying from cancer is going to turn out eventually. The story is somewhat contrived as it is about 2 men who would never associate in their normal lives, that are brought together in a hospital by their common denominator of cancer. One of them is mega-rich and finances their no-limits last fling at life comprised of a list they made of things to do before they kick the bucket. Nicholson and Freeman are 2 pros that could hold your attention watching grass grow so needless to say, their performances live up to expectations. 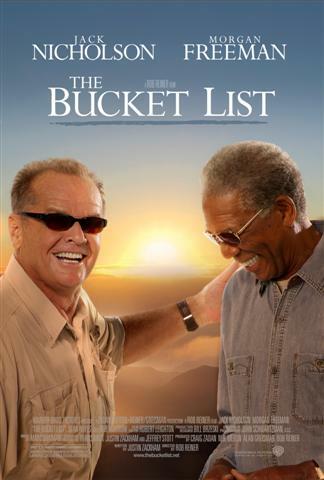 I get the feeling that “Bucket List” is going to become one of those coined phrases like “at the end of the day” that you are going to hear people using over and over. I think most of us have a kind of mental bucket list that we started thinking about when we reached a birthday that had a zero in it. After all, every time we change a decade, there are a number of stereotyped variables that go along with that decade. I think I started my mental bucket list when I hit 40 but I keep modifying it as I age. That’s not necessarily because I have completed some items on the list but because as my values change, some things lose importance and others gain.